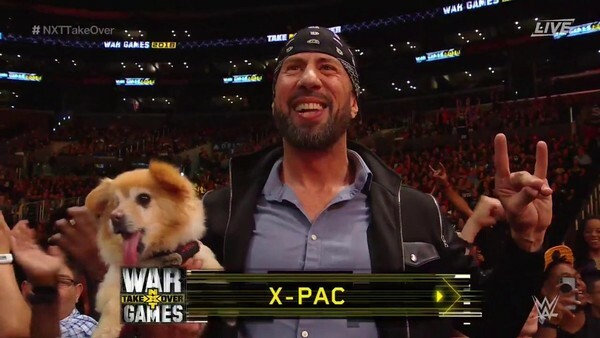 Up until this very week you'd have suspected that X-Pac's close relationship with WWE ruled him out of jumping ship to AEW. After all, there can't be many men who are tight enough with Trips to get a free seat for themselves and a rescue in the front row of NXT: TakeOver. This image above remains the most pure thing that has ever grown out of wrestling's pot of dirt. Anyway, the major headline in WWE's recent Hall of Fame announcement was that Chyna would finally be getting the inclusion she so richly deserved. Included amongst her in the stable were of course HBK and Triple H, as well as latter-day stable inhabitants X-Pac, The Road Dogg and Billy Gunn. The latter of those is the most interesting as Gunn, who was last spotted at the RAW 25 Reunion segment, is currently a producer for AEW. Now surely if the door is open to him to get a brass ring and work backstage for the competition, that's a privilege that can be extended to Waltman as well. The man's decades of experience in the industry and near era-defining ring knowledge (as the 1-2-3 Kid) would be a huge benefit to any promotion, let alone AEW.